Inaugurated the expansion of our joint-venture refinery in Port Arthur, Texas, more than doubling crude oil distillation capacity there to 620 thousand b/d. It is flexible, able to process many types of crude oil and vary the mix of final products based on demand. In Australia, the Clyde refinery was converted to a terminal. Optimised ethylene delivery in Supply and distribution, resulting in a 20% increase in throughput capacity and improved operating flexibility. Continued to demonstrate innovation in fuels technology and superior customer experience in Retail with the first launch of Shell V-Power Nitro+, which is now available in six countries. In China we also had the first launch of Shell V-Power in Tianjin province and signed an agreement with China Union Pay to enable faster and more convenient payment options. Making good progress with the Raízen biofuels joint venture in Brazil, which has a 35 thousand b/d ethanol production capacity. 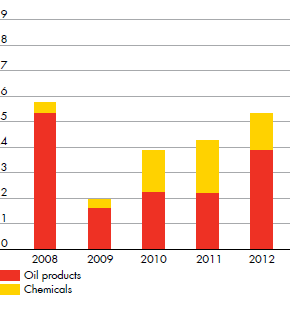 In its first full year of operations, Raízen contributed more than 10% to our 2012 Oil products earnings. Bought the remaining shares in Gasnor, a Norwegian supplier of LNG for shipping and trucking. It gives us a foothold in a growing market for cleaner-burning gas as a transport fuel. Entered into an agreement with joint venture partners to purchase assets at the Coryton refinery in Essex and worked with our partners to develop a state-of-the-art import and distribution terminal. This investment will support growth in our UK retail business, which acquired 253 retail sites in 2011. Agreed to acquire Neste Oil Corporation’s network of 105 retail sites in Poland. These sites are unmanned and located in major cities throughout the country. Progressed the proposed world-scale petrochemicals project in Ras Laffan Industrial City in Qatar by awarding, with venture partner Qatar Petroleum, the front-end engineering and design contract. Agreed with our partner SABIC to expand Sadaf, our long-standing Chemicals joint venture in Saudi Arabia – including proposed construction of new derivative units. 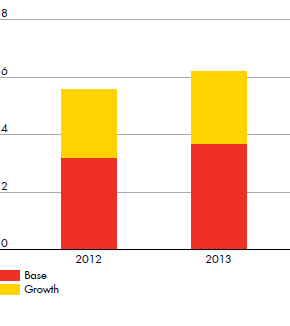 With effect from 2010, Downstream segment earnings are presented on a current cost of supplies (CCS) basis. Comparative information is consistently presented.